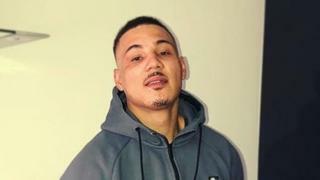 A drug dealer was murdered in a "frenzied assault" by two brothers who stabbed, kicked and punched him, a court has heard. Courtney Jones, 26, died in hospital shortly after being attacked outside a friend's house in Totton, Hampshire, in August 2018. Sid Cooper, 26, will admit stabbing Mr Jones twice in self-defence, Winchester Crown Court heard. He and his brother Charlie, 19, both of Ashby Road, Totton, deny murder. Mr Jones, who was from Wolverhampton but was living in Sheffield, was attacked as he came out of the house in Salisbury Road at about 19:45 BST on 25 August, the jury heard. Adam Feest QC, prosecuting, said a neighbour described the brothers as "like a pack of wolves" in the way they set upon the victim on a driveway before cutting a bag of drugs and money from his body. He said Mr Jones was "stabbed at least twice ... in a frenzied attack". Mr Feest told the court Charlie Cooper held Mr Jones in a headlock and assaulted him. He was later arrested at home hiding under a pile of blankets, the court heard. His older brother Sid began to fit and vomit blood soon after he was arrested near a travellers' site in Totton, Mr Feest told the jury. Cocaine was found on his clothes and body after he was taken to hospital, the court heard. In police bodycam footage shown to the jury, Sid Cooper was charged with murder and replied: "Courtney Jones? Who's Courtney Jones?" He later made a statement saying Mr Jones, who was also known as Tim or Timmy, had attacked him and Charlie with a knife. Mr Feest said the motive for the killing was not clear although "it may be that illegal drugs played a part". As he fled the scene, Sid Cooper told a neighbour: "I had to do him. He was selling drugs to my 14-year-old daughter," Mr Feest added.